Evidence suggests that the climate is warming, but it's hard to get a concrete idea of what the planet will be like when Earth is a few hotter warmer everywhere. Now a group of scientists have found a slice of our sultry future in an unexpected place: the heat islands of southern US city Raleigh, North Carolina. Judging from what's happened in Raleigh, we're looking at a future full of tiny, deadly insects. Entomologist Emily Meineke and her colleagues collected samples of insect pests in the warmest parts of Raleigh, because, as they wrote in their recent PLoS One paper, "urban warming is similar in magnitude to global warming predicted in the next 50 years." What they discovered was that a beige, sequin-sized bug called a "scale insect" was "13 times more abundant on willow oak trees in the hottest parts of Raleigh . . . than in cooler areas." 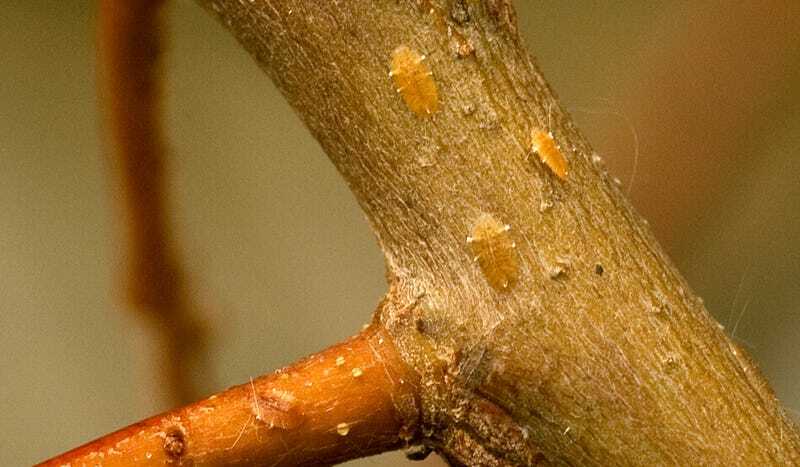 Scale insects are parasites which permanently attach themselves to their plant hosts, gradually killing them. Warmer trees have more scales insects, which likely leads to trees that are less healthy than they could be. This in combination with other urban stresses such as pollution and soil compaction, means more trees are likely to die. Since trees cool the environment and reduce pollutants in the air, cities will be less healthful for people. Since trees are also home to many birds, other vertebrates, and the critters they eat it could disrupt many parts of the ecosystem. Scale insects are common in urban areas throughout the world, so it's likely we'll see more scale insect infestations as our cities warm. Cities warm more quickly than rural areas, but Meineke and her colleagues warn in their paper that the conditions in Raleigh will soon spread to wild forests as well. If insects overwhelm trees in these areas, all the animals who depend on those trees will become vulnerable. This is how mass extinctions begin, as zoologist Peter Roopnarine has pointed out in his work on collapsing food webs. First, a cornerstone of the ecosystem dies out and then that leads to knock-on extinctions among other creatures and plants. If you want to know what cities of the future will look like, without any checks on global warming, imagine every tree covered in waxy scale insects. They're not terrifying like CHUD, or disgusting like cockroaches. But sometimes the creatures we fear the least turn out to be most destructive.